If you could travel back in time and talk to your younger self, what would you say? If you could stop a tyrant before he becomes one, would you? There are no easy answers in "Looper" – one of the most interesting and inventive time travel movies in years. A looper is an assassin hired to take out "the future's garbage." Joe (Joseph Gordon-Levitt) is one of many. Writer and director Rian Johnson brings the year 2044 to life by crafting a masterful story and infusing it with all sorts of cool little details. In addition to time travel and the concept of loopers, Joe's personable narration informs us that there are also "TKs" – people with telekinetic abilities. However, far from being the "superheroes" everyone was expecting, their "powers" amount to nothing more than being able to float a quarter in mid-air – a mere parlor trick – and that's it. If you're fired from an ordinary job, you're sent on your way, free to live your life. If a looper is let go, he's forced to kill his future self first. It's called "closing the loop." Most loopers blindly do as they're told and live out the thirty years they have left. Seth (Paul Dano) isn't one of them. He can't bear to murder his older self (Frank Brennan). 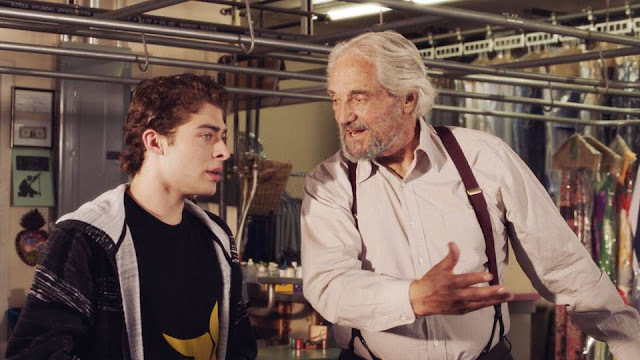 He goes to Joe for help and warns him that someone from the future is closing all the loops. It doesn't take a genius to figure out that Joe himself is next. Whether or not Young Joe is willing to close his own loop, Old Joe (Bruce Willis) can't let that happen. In a way, the situation is somewhat reminiscent of an earlier Willis role – "Disney's The Kid." In that one, he met the 8-year-old version of himself. Both movies even feature a diner in the middle of nowhere. The two aren't actually related, of course, and "Looper" is much darker overall. After Old Joe escapes from Young Joe, the chase is on. But other people are looking for them too – including Abe (Jeff Daniels) and Jesse (Garret Dillahunt). Young Joe ends up hiding at an old farmhouse where Sara (British actress Emily Blunt, speaking with a flawless American country accent) and her young son Cid (Pierce Gagnon) live. Much has been made of Joseph Gordon-Levitt's face being altered to resemble Bruce Willis's. Truthfully, he looks more like "SVU's" Danny Pino than Willis, but it still works overall. I expected to be constantly distracted by the makeup, but I never was. Levitt's acting talents go a long way in making this otherwise jarring effect a success. I could be wrong, but it sounds like he changed his voice and speaking style too. Whatever he did, he makes it easy for the viewer to accept his new look. The transition is almost seamless. 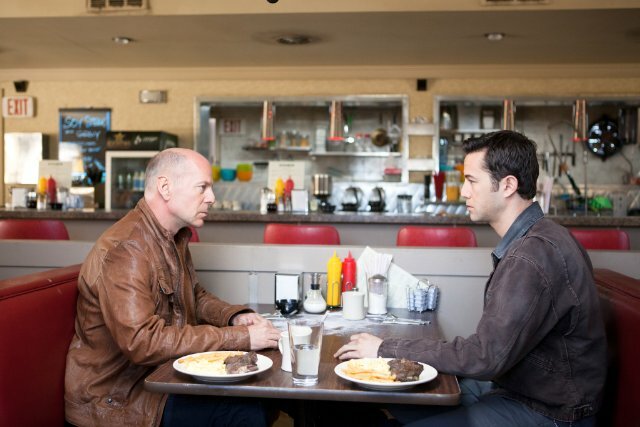 Rian Johnson has created a fascinating futuristic world in "Looper." It's one of the best sci-fi films to come out in a long time.